Jewish Community of Zemun gathers all Jews who live on the territory of Zemun borough of the City of Belgrade. 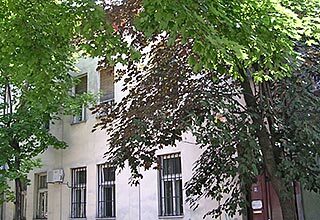 It is also domicile community for all the Jews of Zemun origin who live abroad. In spite of the fact that the community is rather small, as a result of Holocaust when almost whole of the community vanished, it is working very hard to participate in cultural and religious life in Zemun. Numerous activities of our community are pointed both to stop assimilation and to mutual respect of those of different religion or those of different nationality. The main premise of our engagement is: "respect others so they can respect you" and that is why we can freely say that we have a lot of friends in our neighborhood. Historiography and collecting documentation and other historic materials regarding life and activities of Zemun Jews, especially from the period of Shoa and with collaboration with Jewish Historic Museum in Belgrade. Cooperation with other Jewish communities and Jewish and non-Jewish organizations in the country and abroad. Assisting in solving social problems of the members of JOZ by supplying material and non-material aid. Organizing of all other activities that are in accordance with the main goals of JOZ and with Jewish tradition.